Rte 95 North to Exit 63. Take an immediate left off the exit and another left at the traffic light onto Rte 81 North. At the next light (just over the highway), take a right onto Glenwood Road. *Go to the third stop sign. 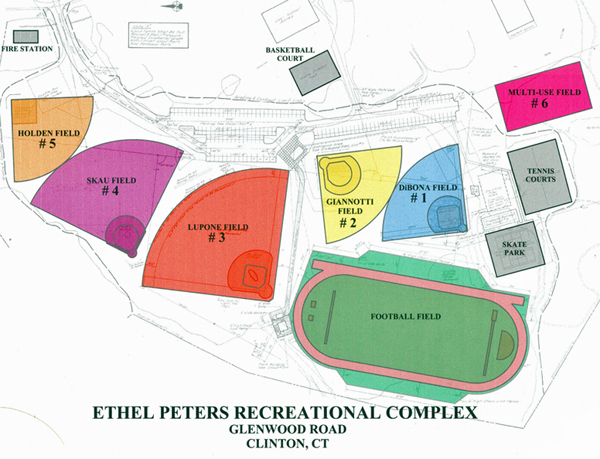 The entrance to the Ethel C Peters Recreational Complex will be on your left. Rte 95 South to Exit 63. Take a right the end of the exit ramp onto Rte 81 South. At the next light take a left onto Glenwood Road. Follow the directions from asterisk (*) above. Rte 9 South to Exit 9. Take a right onto Rte 81 South. Follow for several miles, through Killingworth, around the Killingworth Rotary Circle (Shell Gas Station will be on your left), to Clinton. Just past the Indian River Recreational Complex, lake a left onto Hurd Bridge Road and follow to the end. At the stop sign take a right. The road turns into Glenwood Road. Go through the next stop sign (a small fire station will be on your right) and take a right into the Ethel C Peters Recreational Complex.